Run up Winter Hill, out and back from the house, on Saturday morning rather than the usual 20 miles to try and avoid the high mileage and torn calf of this time last year, knowing That’s Lyth on Sunday would provide another 21 miles. An organisational problem at the first check point where I was marshalling meant I couldn’t have my porridge before setting off. I thought a sandwich and some malt loaf (I couldn’t manage any doughnuts for breakfast) would be sufficient. In the absence of any alternative they were going to have to be sufficient but more of that later. The CP was entirely outside and so no hot drinks for anyone which meant I was probably not properly hydrated and despite the extra clothes (while marshalling) both David and I were pretty cold when we set off. As before, we went at our pace and I was soon on my own passing the slowest of the walkers. The first seven miles or so to CP2 were fine despite the cold head wind. At CP3 a number of nearly under control dogs were milling about in the entrance, barking loudly, pulling on their leads and completely blocking the doorway. I wasn’t at all hungry and so decided not to stop – I was carrying some food and water anyway. At the last CP I was a couple of minutes down on last year and feeling OK, a little weary but not hungry. A couple of biscuits and some cold water to see me to Kendal. The long down hill into Kendal although it is on the road is always good and even knowing I was going to have to turn run and get back up it didn’t spoil the pleasure. Still not hungry, I passed on the peaches and rice but had some water and set off back to the last CP. By the top of the hill I didn’t feel too bad – last year I stopped for food and my legs were very tight and stiff when I left Kendal and I was pleased to have avoided that. The last two miles down off Scout Scar were great and I didn’t feel bad when I finished until I checked my splits and found I was about 30 minutes slower than last year – almost all the time was lost into and out of Kendal and almost certainly due to nearly no food and not enough water. Maybe too much malt loaf at the start but I should have known I wasn’t eating or drinking enough – last year this happened at the Anglezark Amble. It seems like I need to “learn” again, every year, that eating and drinking has to happen on long runs! If that is this year’s lesson out of the way before any serious then perhaps it is for best – but how can I forget stuff as basic at that so easily? A rest day Monday to make sure any ill-effects from Sunday were gone and to keep the week’s mileage in the mid 60s. Nearly good track session – I find it very difficult to pace track sessions and need to find another runner to chase (thanks, Gaynor for last Tuesday) and even then I struggle to get to the end of the session without ‘dying’. Congestion on the motorway in the aftermath of a serious crash last night prevented me getting to Horwich in time for the Hills session so I finished the week with 5.5 mile road run. Tuesday morning’s run was especially good because, just as I was finishing the first light of the day was brightening the sky. Not the first Cuckoo but a reminder that the days are getting longer. A run in the Lakes on Saturday with Colin Jones and perhaps Paul Murray, if he has recovered from bruised ribs caused by falling on his ice axe last weekend in Wales. Lunch in Staveley, on Sunday, our final “Xmas Lunch” of the season with a LDWA group and then whatever can be fitted in as the final preparation for the first race of the year – Winter Hill on the 8th February. From Broughton Mills to Caw is the least familiar part so on Saturday morning Pauline, Keith and I left Broughton Mills for Great Stickle, Stickle Pike and Caw. At Stickle Pike Keith decided not to try to keep up with us but would aim to meet us later, before Swirl How, by missing Coniston Old Man. The high fells were wreathed in grey, ominous clouds but the cold wind was behind us. At White Maiden we got our waterproofs on, not because of the threat of rain but the strengthening wind was now buffeting and chilling us and we had more height to gain. Into the clouds over Dow Crag and Coniston Old Man where we stopped, briefly behind the summit cairn, for a bite to eat. Along the ridge to Swirl How where the distinctive cairn was plastered with ice. Our original intention was to ‘tick’ another couple of summits but the “Old County Tops” race route to Cockley Beck and shelter from the wind was too tempting. From there we took the road and footpaths back to High Moss to finish a 16 mile, 5000 foot day. 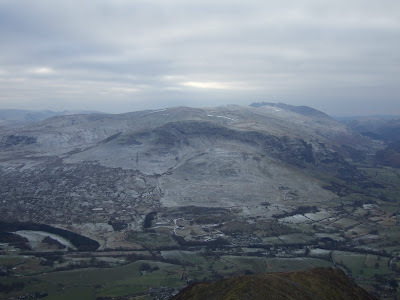 After Saturday night’s storms and a bit of snow on the high fells we went back over Caw to collect Keith’s car – the three of us – and settled on the weekend of 4/5 April to attempt the whole route on a self-supported basis. This reverse recce allowed us to have another look at the route and make a couple of changes to remove some unnecessary climbing a ease the route finding. The grey clouds obscured most of the mountains but Harter Fell appeared briefly to dominate Duddon Valley on a very cold Sunday morning. Most of the rest of the week has been cold, icy or wet and sometimes all three during the same session. I would have missed the track session had it not been cancelled and this has been the worst week of early morning weather all winter, I think. I have still managed to get out on all four mornings, an evening and finally last night’s hill session. Hill sessions just don’t get any easier – if anyone tells you they do, they are lying! This month sees the retirement of two pairs of road shoes, a pair of Mizuno Wave Riders after 467 miles since Dec 2007 and a pair of Nike Vomero 2+ after 503 miles in the same period. The Wave Riders were too light for my stiff feet and didn’t provide enough cushioning for very long runs but the Nikes have been brilliant – so good I have another two pairs in use with a further pair still in a box for later in the year. I have ‘discovered’ Twitter which is a lot of fun. So far I have found about another twenty runners, all in the States. Surely there are some on this side of the pond? Run up Winter Hill on Saturday and then “That’s Lyth” on Sunday where we are marshalling, as usual. Planning on 12 miles on Saturday, 21 in Sunday and hoping the fierce weather passes through on Saturday night as forecast. I had a look at last year’s records for this weekend and found I did 20 miles on the Saturday and then 21 at '”That’s Lyth” and continued like that for a few weekends until I tore a calf muscle in the middle of February. I suspect the two are related and that this is too early in the year for 70 mile weeks and so I am going to increase my mileage more gradually this year to try to avoid injuries. After the ‘party’ on Winter Hill summit we went to Glasgow to celebrate my Dad’s 83rd birthday with him. The forecast was poor and before we arrived at the outskirts of the city we reached the strong winds and heavy rain. Conditions deteriorated and by Sunday morning were fairly unpleasant for running. I managed round the loop through Mearns Cross, Eaglesham and Waterfoot despite the near-horizontal rain coming off the moors around Eaglesham. A couple of weeks ago, coming down Doddick Fell on Blencathra, I slipped and “sat down” rather heavily bruising some muscles (I think) in the process. During the week immediately afterwards they were a little tight and didn’t seem too bad but this week they have bothered me much more. All week they have been slow to loosen up and at the track session on Tuesday they tightened up between each rep so that the ‘run’ home afterwards was a pretty slow plod, even by my own sedate standards. The two early morning sessions since were a bit uncomfortable but last night, rather than the hill session, I ran a short road session and everything felt much better so I am hoping everything is sorted. I needed an easier week after over 25,000 feet of climbing in the previous two – it is too early in the year for so much climbing! Despite the forecast we are going to the Lakes for the weekend at High Moss. The worst of the weather is due late Saturday afternoon and overnight when we will be safely ensconced in the Rucksack Club hut. 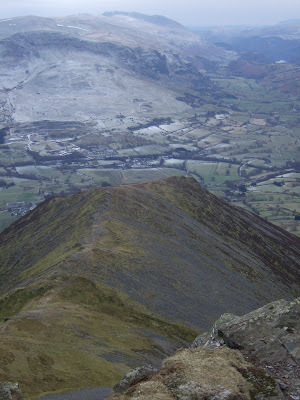 Before then we will go and have a look at the start of the ‘Cumbrian Traverse’ with Keith. We are going to have a go at it later in the year but none of us are familiar with the start from Broughton. This could go badly because we are often blighted by bad weather with Keith, for instance, we (Keith, Pauline and myself) had to survive blizzards in April 2004 on our successful ‘Over The Hill’ completion. At the time this challenge was open only to the Over 50s and Pauline wasn’t old enough to join the ‘Over The Hill’ but she remains the first woman to complete the route. On out way north on Sauturday morning Colin and I were undecided about where to go after Blencathra, our initial destination. The Northern Fells leg of the BGR (and back to Threlkeld) involves two river crossings which on cold days like today aren't terribly attractive so we decided on multiple ascents of Blencathra. I have never been up or down Gategill Fell over Knott Halloo but it turns out that not only was there a fell race to Knott Halloo and back but on the final occasion it was run Colin finished 3rd so he knew, at least the first part of the climb. Looking south from Gategill Fell top, Knott Halloo is the rocky outcrop on the right at the end of the ridge. The inital ascent is very steep and the trods are littered with loose stones as they go through 'ankle-grabbing' heather. At this time of year a little care is need but I was pleased we didn't have to race back down. The weather had deteriorated since New Year's Eve and for a good while it looked as though we might see some snow but it didn't materialise and I think the 'sprinkling' in the photo is actually accumulated frosts. Further north the sun shone over the Solway Firth and we could see snow capped hills in southern Scotland. After Gategarth Fell top we crossed Hallsfell Top and dropped down over Aitkinson Pike, round Foule Crag to the foot of Sharp Edge for our second ascent to Hallsfell Top which was getting more crowded by the minute. Back and down Doddick Fell, which is probably the most delightful of all the ridges and very runnable, to the foot of Halls Fell ridge for our third and final ascent. From the top we crossed Gategill Fell top and just beyond Knowe Crags dropped down to Threlkeld - just to completely trash our legs and complete a fine morning out. On Sunday I managed 10 mile recovery run but even that and Monday & Tuesday mornings' runs didn't leave my legs in a condition to tackle the track session. Another couple of morning runs and then a hard hill session last night to complete the week. These have been a couple of very hard weeks 111.7 miles and just over 25,000 feet of climbing in 13 days. We are in Glasgow to celebrate my Dad's birthday with him and so it is going to be a matter of fitting in road miles where ever I can - probably all early mornings and the forecast for the weekend in Glasgow is best described as 'character building'. It could be a good test for my new waterproof jacket. After last year’s dismal weather were looking forward to the settled cold spell the forecasts promised. As a taster, on the way to Keswick, we stopped in Ambleside for a jog round an ‘extended Fairfield Horseshoe’. A couple of years ago we realised we had walked the Fairfield Horseshoe four of five times in mid –winter, enjoying sunshine and blizzards in equal measure, and decided to make it a tradition and, if possible, to include the extension of the descent from Red Screes. Although we added Red Screes this year we missed the best part of the route by running and getting down before dark. 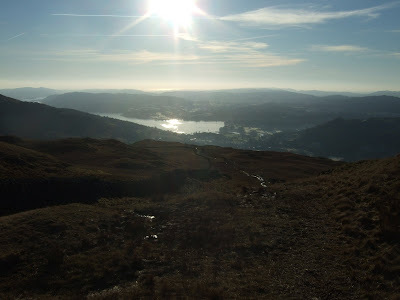 Walking off Red Screes after sunset provides a wonderful view of the Christmas Lights in Ambleside. Running down after dark would need too much concentration and anyway the gear shops were having sales! 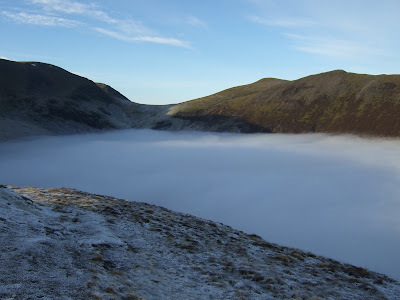 With the weather improving we followed this with another look at the first leg of the 55at55 starting at the foot of Causey Pike and visiting Causey Pike, Scar Crags, Sail, Crag Hill, Wandope, Whiteless Pike and returning over Knott Rigg and Ard Crags. I had wanted to include Ranerdale Knott but this might have added another hour and a very cold hour as all the valleys were still frozen hard. We stopped on the ascent of Knott Rigg to watch cars struggling to get into and out of Newlands Hause from Buttermere. One made it down to Buttermere whilst two gave up and both cars climbing out of Buttermere gave up and reversed back down the road – while we sat in warm(ish) sunshine. 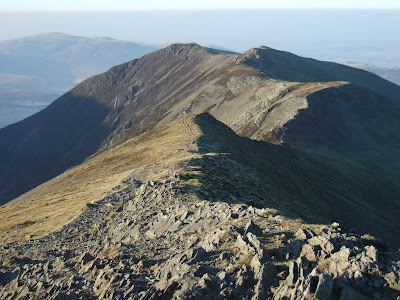 I tried this leg in the dark and concluded it is just too difficult to get anything like a reasonable line off Whiteless Pike in the dark and so I am going to start my 2009 attempt on Saturday morning to do this leg in daylight. After a couple of very cold nights the temperature didn't fall below about -2 but this was still enough to keep the ground frozen solid - the perfect time (the only time) to tackle the Bleaberry Fell to Armboth Fell ridge and so we did. The ground was solid and badly rutted in many places and in many others was simply ice and so progress was slower than we would have liked. Until High Tove we saw no-one else other than the hordes on Walla Crag who didn't seem interested in venturing this far south. High Street remained shrouded in clouds, as it had all week, but the rest of the high fells were bathed in winter sunshine. Having done most of the Grasmoor fells earlier we decided to try to visit the rest to add them to our 'Third Round' of Wainwright's high fells. Up the Coledale Valley to the hause and over Sand Hill to Hopegill Head and Whiteside which we had to ourselves. The solitude wasn't to continue as, even from here, we could see the procession over Grisedale Pike making its way over Hobcarton Crag to Hopegill Head. Returning to Hopegill Head we met the vanguard settling down for morning coffee. 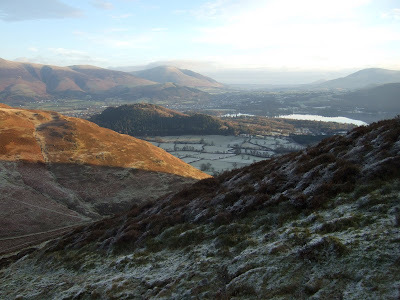 By the time we reached Grisedale Pike it was like the queue for Woolworths' closing down sale. New Year's Eve dawned damp and foggy in Keswick and looked like it wouldn't clear all day. Back to Braithwaite we went to go back up the valley and down over Outerside for a short morning before coming home. About half way up Outerside we emerged frm the clag into glorious sunshine to see an inversion covering everything below 1500 feet. 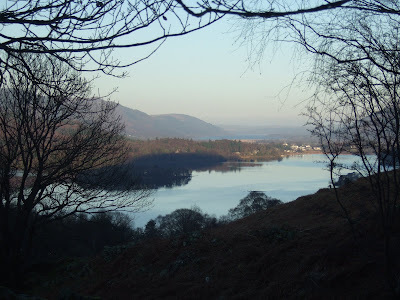 May try to get back to the Lakes on Saturday and do something locally on Sunday - avoiding the M6 on Sunday is a 'must' and then the grindstone calls, I am afraid, but this has been a wonderful week.